Pope Francis failed to mention Myanmar’s Muslim Rohingya minority as he shared a stage with the country’s civilian leader, Aung San Suu Kyi, saying the country was suffering from civil conflict and hostilities “that have lasted all too long and created deep divisions”. Speaking in the capital, Naypyitaw, on Tuesday afternoon, the pontiff talked of the need to “respect the rights of all who call this land their home”. His visit to Myanmar comes after an exodus of more than 620,000 Rohingya from Rakhine state to the southern tip of Bangladesh after a military crackdown that the UN, US and UK have described as ethnic cleansing. The trip is, however, so delicate that some papal advisers warned him against even saying the word “Rohingya”, lest he set off a diplomatic incident that could turn the country’s military and government against minority Christians. 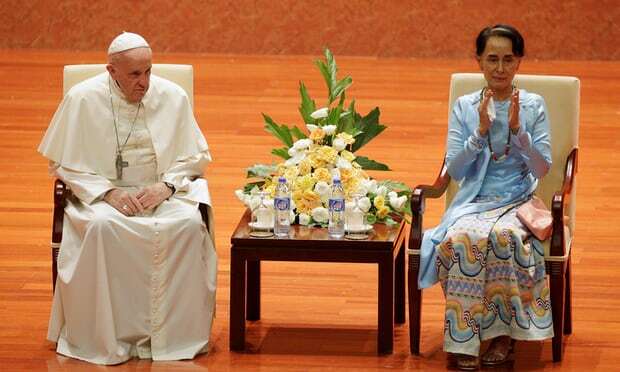 “The future of Myanmar must be peace, a peace based on respect of the dignity and rights of each member of society, respect for each ethnic group and its identity,” Francis said, speaking after Aung San Suu Kyi had made an address. Myanmar does not recognise the Rohingya as citizens or as members of a distinct ethnic group with their own identity, and it rejects the term “Rohingya” and its use. Phil Robertson, the deputy director of Human Rights Watch’s Asia division, said the pope had missed an opportunity, adding that the “Rohingya have been stripped of so many things but their name should never be one of them”. Mayyu Ali, a Rohingya refugee who recently fled the violence and lives in a camp in Bangladesh, said he was disappointed the pope did not speak more directly. “He should keep speaking up for the truth as he did before. Last year, he cited ‘Our Rohingya brothers and sisters’. And he said more about our suffering,” he said. However, the EU’s ambassador to Myanmar, Kristian Schmidt, praised the speech, saying it was unnecessary for Francis to talk directly about the crisis. The meeting with Aung San Suu Kyi was the most anticipated of the pope’s visit, given the international outcry over the crackdown on Myanmar’s Muslim Rohingya minority. The operation against the minority was launched in August after Rohingya militants attacked security posts. Rohingya fleeing into neighbouring Bangladesh have reported that entire villages were burned and looted, and women and girls were raped. On Monday evening, Oxford city council stripped Aung San Suu Kyi of the freedom of the city award it gave her 20 years ago, saying those who turn a blind eye to violence tarnish its reputation. On Wednesday, Francis will preside over a mass service in the commercial capital, Yangon, which tens of thousands of people are expected to attend, before flying to Bangladesh on Thursday. Myanmar’s 650,000-strong Catholic community has been eagerly anticipating the visit, but the excitement has been tempered by fears that bold remarks by the pope could spark nationalist anger towards them. Speaking shortly before the pope flew into Naypyitaw, Father Gregory, a priest from northern Myanmar, said attitudes were divided on the issue. “Some people want him to say about Rakhine state and some people don’t want to say about this,” he said. He declined to express his opinion, citing the extreme sensitivity of the issue. “Kind of a dilemma, so I cannot say,” he said. Myanmar’s Catholic leaders have stressed that Aung San Suu Kyi has no voice to speak out against the military over the operation, and have urged continued support for her efforts to move Myanmar towards a more democratic future that includes all its religious minorities, Christians in particular. During talks on Monday evening, the country’s powerful army chief told Francis there was “no religious discrimination” in Myanmar. Hours after the pontiff landed and was welcomed to the country by thousands of Catholics, Gen Min Aung Hlaing told the pope the military “performs for the peace and stability of the country” and there is “no discrimination between ethnic groups in Myanmar”. Before delivering his speech on Tuesday, Francis spoke to interfaith leaders at the archbishop’s residence and separately met a prominent but controversial Buddhist leader. The pope stressed a message of “unity in diversity” in his 40-minute meeting with Buddhist, Hindu, Muslim, Christian and Jewish leaders. He told them they should work together to rebuild the country and that, if they argue, they should argue like brothers, who reconcile afterwards, his spokesman, Greg Burke, said. His meeting with the Buddhist monk Sitagu Sayadaw was “always in an effort to encourage peace and fraternal coexistence as the only way ahead”, according to Burke.